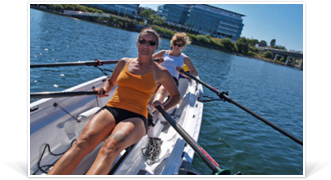 Whitehall Spirit® Rowing Club is a members-only club and boats are only available to WSRC members. This means that boats are not available to rent on a one-time basis by the general public. All rowers receive a one-on-one introductory orientation and training session with one of the club’s ‘All Water’ rowing instructors. This ensures that members know the procedures of the club and are skilled and confident enough to launch, row clear of the dock, and safely navigate in a busy harbour. The Victoria Harbour Club fleet features two Whitehall Spirit® single-position Solo 14™, and two double-position Tango 17™ slide seat-sculling boats. The Oak Bay Marina fleet features three Whitehall Spirit® single-position Solo 14™, and one double-position Tango 17™ slide seat sculling boat. At both locations, the boats are parked on top of specially designed low floats and are ready to slip into the water. Members have online access through a personal account to book the boat of their choice, with gear, for a number of hours. WRSC members simply enter their name and password into the online booking platform to reserve a boat for the date and time they wish to go rowing. The booking system keeps track of hours used and sends the member access codes for their chosen time booking via email. All Whitehall Spirit® sculling boats are capable of carrying passengers, adults, children, or pets. Each boat is equipped with standard safety and rowing gear, including carbon-fiber sculling oars. However, children’s personal flotation devices are not provided and users must supply their own if they are taking any children with them in the boats. Children under the age of 12 must wear their PFD while aboard a boat. Launching and retrieval are easy and take under five minutes. Members much make sure they are keeping the boats clean and tidy so they are ready for the next person to use. For safety reasons, members must post their departure time and estimated return time before they depart. Club hours are 5am to 10pm, seven days a week (last booking at 9pm). Developing a personal weekly rowing schedule is simple and easy using the online booking system. It’s flexible – most members book their time in one – four hour periods. Bookings can be cancelled and re-scheduled. Members are set up with an account and password to access their bank of time online. Annual hour-based packages are available for members to purchase. 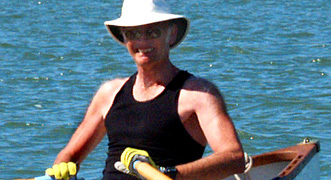 Rowing can be enjoyed year-round, except during extreme weather. Click JOIN NOW for rates and details. You can book rowing times in advance at any time, or book within 15 minutes on a given day provided a boat or board is available. You can reschedule or cancel a booking within 1/2 hour of your time. Enjoy the thrill and share the fun of open-water slide seat rowing by yourself, or with friends or partners. Stay fit and healthy while connecting with nature, wind and water. You will burn up to 800 calories per hour while sculling, with no stress on your joints and ligaments. Using a slide seat means that most of the power is supplied by both legs driving together. This produces double the calorie burn of jogging and little to no stress on the knees. Members also report major stress relief and mental health benefits from getting out and connecting with nature while on the water. Get Ready For A New Passion… Release Your Inner Rower. 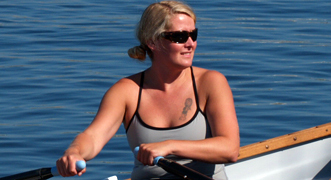 Diana is the Club Manager and “All Water” Rowing Instructor. She loves to row, and her enthusiasm is infectious. In 2012, she managed the WSRC of Marina Del Rey and taught hundreds of “All Water” rowers how to row. She completed a 40-mile Ocean Rowing Event rowing from Marina Del Rey across to Catalina Island in under 9 hours. 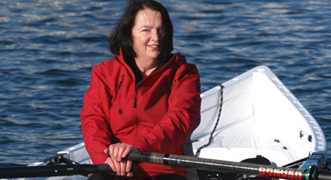 WSRC co-founder, Marie originally conceived of the WSRC club concept and co-designed the operating system that allows this affordable type of community-based rowing. She loves to train new members when time allows. WSRC co-founder and co-designer of the WSRC operating systems. 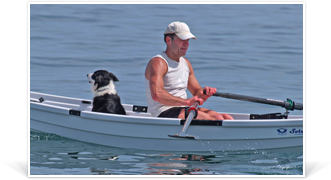 Harold grew up rowing small boats in open water and has sailed across oceans. He also occasionally trains new members and conducts special classes in rough water boat handling.